Senior year, I thought I would be thrown out of school. Using our "honors student" keys and unlimited privileges in the science labs during evenings, Phil and I made a concoction of explosives using readily available materials. Neither of us was later recruited into the CIA, but we were even at age 16 pretty resourceful. We carefully dried the product of several easy chemical steps on folded paper towels neatly laid out on the impervious black lab counter, finally gathering the now violent little brown crystals into small glass vials. In those days there were mandatory school meetings where Headmaster Wilkie sat in his Eames chair next to the fireplace, usually with a guest of honor or the Dean sitting in a matching chair at the other side of the fire. The entire student body then sat at their august feet on thick oriental carpets (the same ones that were rolled up for the tea dances). When the meeting was about fully assembled, we drifted across the front of the room and carefully unloaded the odious vials onto the stone hearth between the two honorables by tipping them secretly from our blazer pockets. Crystals were sprinkled unseen like nuclear fallout onto Nevada rock and lay there dormant as we took places in the crowd. When Mr. Wilkie arose to introduce our guest, who was Walter Lord, the noted author and maritime disaster expert, he stepped onto the loaded hearth. It was a smokeless sound like tearing statically charged nylon from rubber, but there were occasional louder pops and crackles as the event continued for a long second or two. 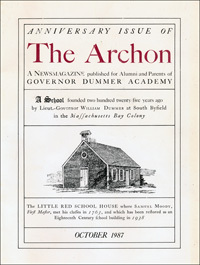 With magnificent aplomb after his startlement, and in a terrible vacuum of silence which included none of the outbursts of laughter or glee which we had so expected from the student body, the Headmaster flatly continued his introduction. Mr. Lord, however, thanked the crowd for the splendid pyrotechnic exhibition (those were his exact words), but in the brilliance of understanding that only comes too late, suddenly Phil and I knew we had had it. They would inexorably hunt us down like ferrets on the spoor of field mice. They would write letters to our colleges and cancel four years of preparation. They would phone our parents who would come to collect us in ignomy. So we walked aimlessly across the Byfield moors for hours and hours that night, coming to grips with what to do and smoking Pall Malls one after another. We decided the best course was to beat them to the punch and turn ourselves in. Then, in the nolo contendere fashion of a confessional, we could beg mercy. The Mansion House was still brightly lit inside and the sounds of partying echoed onto the doorstep as we rang the bell. A spirited faculty reception was underway for Mr. Lord. I will never forget the young Mr. Williams opening the door of the Mansion House and asking, "Yes, what is it?" He was the Prince of Darkness and filled the doorway with his immensity. He was probably all of 25 years old, but was the vast embodiment of inescapable authority and justice. We stuttered things like "We did it" and "We're sorry" and "What should we do" and wrung our hands in the greatest agony. He listened for a while and then he smiled! "Now isn't the time to talk," he said, "we'll meet tomorrow morning." Would you believe it, he smiled! Maybe there was Hope! Desperate tension bled away into the night air; the faintest glimmer of Hope was all that we needed to lift the suffocating leaden weights of conscience just enough that we might endure another day. You don't need to worry at all about the ammonium iodide, if that's what it was. As I've just written your partner, I used to do far worse things myself and hope I never get so stuffy I forget it. In my last book, The Good Years, I pointed out that the great thing about that period was that everybody had bold ideas and could hardly wait to try them, whether they worked or not. Your project may not have panned out too well, but at least it was a bold idea. I like lively poeople and hope I get a chance to come back soon and meet my favorite "culprits." Meanwhile, all the best. Written in March, 1987. 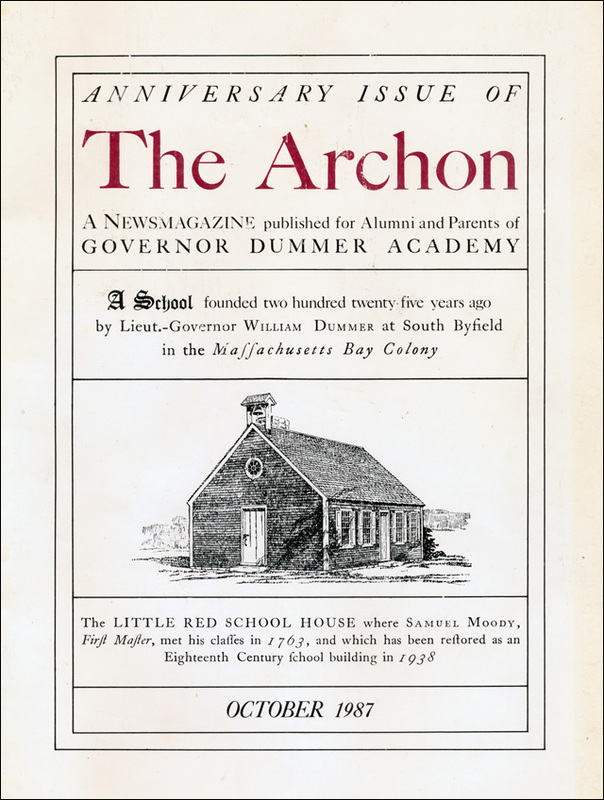 First printed in The Archon, the magazine for alumni of Governor Dummer Academy (now called the Governor's Academy), Byfield, Massachusetts. October, 1987. Author's Note: In checking dates, it seems this event actually occurred at the end of Junior, not Senior, year. Some of us take longer than others to grow up. During my sophomore year at GDA I was pretty un-grownup and still wandered through life with an egocentric personality which was not at all pleasant to my classmates and was more than once the focus of high tension. Now, as I squint into the backside of time's telescope, the sharply-outlined Lilliputian image of those years clearly portrays an occasionally horrible little 14-year-old struggling with identity. So when Eddie Kleven, on behalf of all my offended peers, "called me out" in front of the dormitory to teach me a lesson, I underwent one of those experiences which serves ultimately to smooth a personality's rough surfaces. It was sort of formal. First we were standing, then we were on the wet grass. Then we struggled and maneuvered for a few minutes until Eddie got on top and I couldn't move any more. Then it was done and the ring of seconds, dormmates and curious passersby returned to their preoccupations. Adrenalin, I think, is the catalyst which elevates such experiences to a ready recall of the past. I still remember the musky green smell of earth and grass on that springtime day. And Eddie, you are forgiven.